I feel really bad admitting this but the only facial sun protection I use is whatever level of SPF happens to be in whatever skincare or makeup products I'm using on my face that day. I know that because your face is always exposed you should be using a facial sun cream all year round, but I don't use one in the summer (unless I'm actually sunbathing) let alone in the winter. 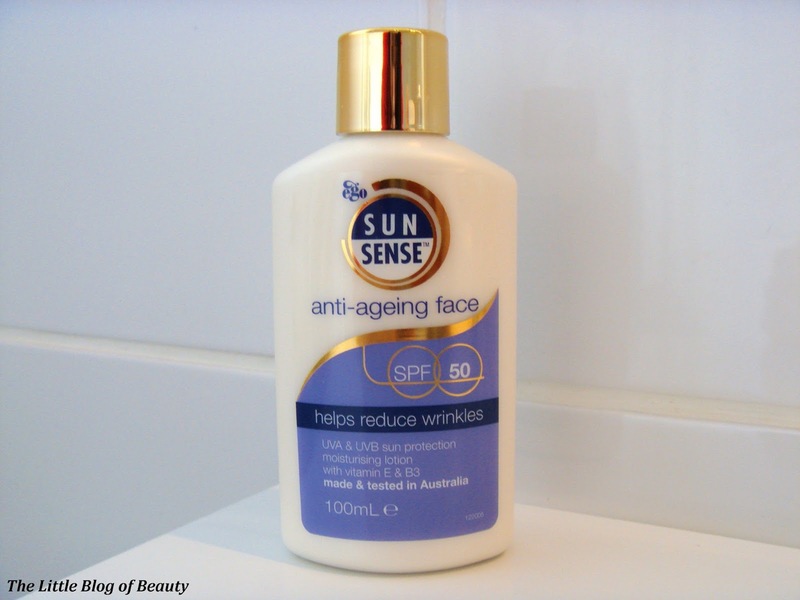 The issue I've always had is that I haven't found a sun protection cream that doesn't leave my skin feeling at least a little sticky or oily, and that's far from ideal for applying makeup over the top. 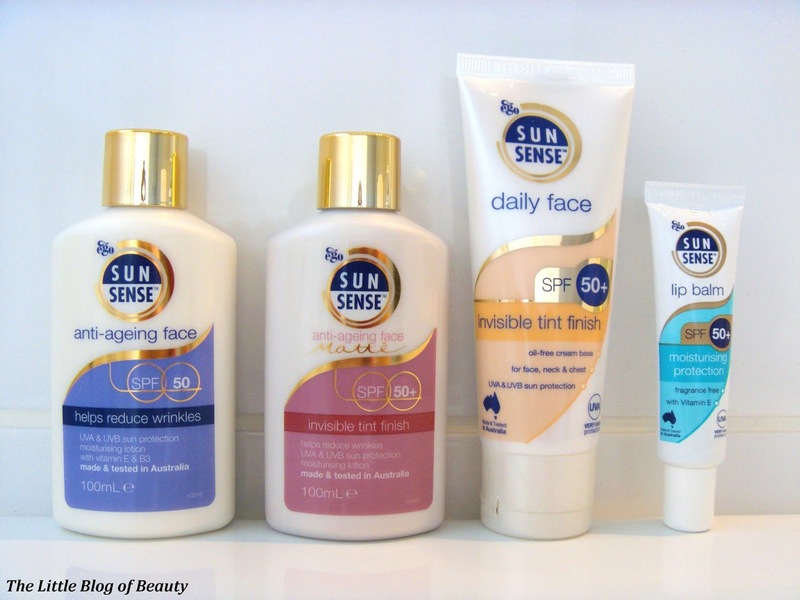 I'd already decided that this year I was going to try and find a sun protection cream that I'd be happy using under makeup and then I was asked if I would like to try out some of SunSense's products. 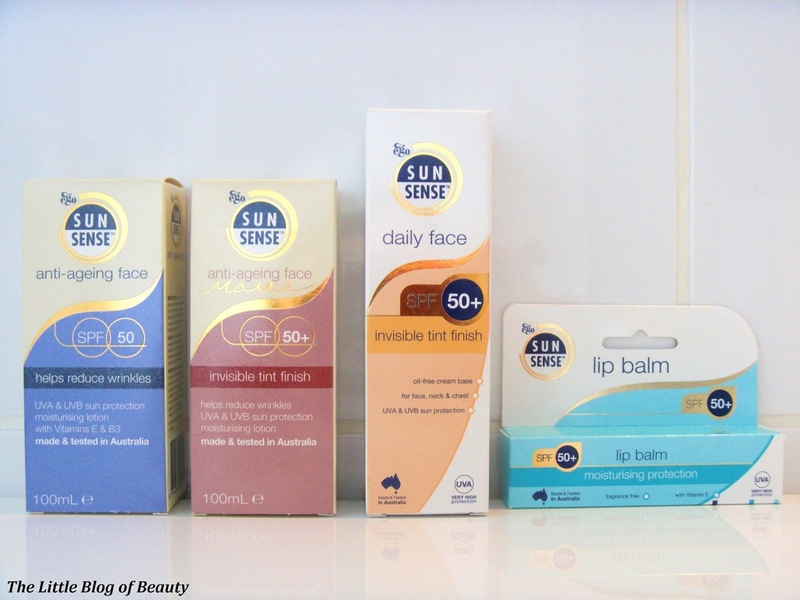 SunSense is an Australian brand that I've only heard of because I received a sample of one of their products in a Glossybox. I haven't actually got round to giving this a try, because the little tube had a snap off seal on it, so I wasn't sure if you'd be able to reseal it once it had been opened and this put me off giving it a try. 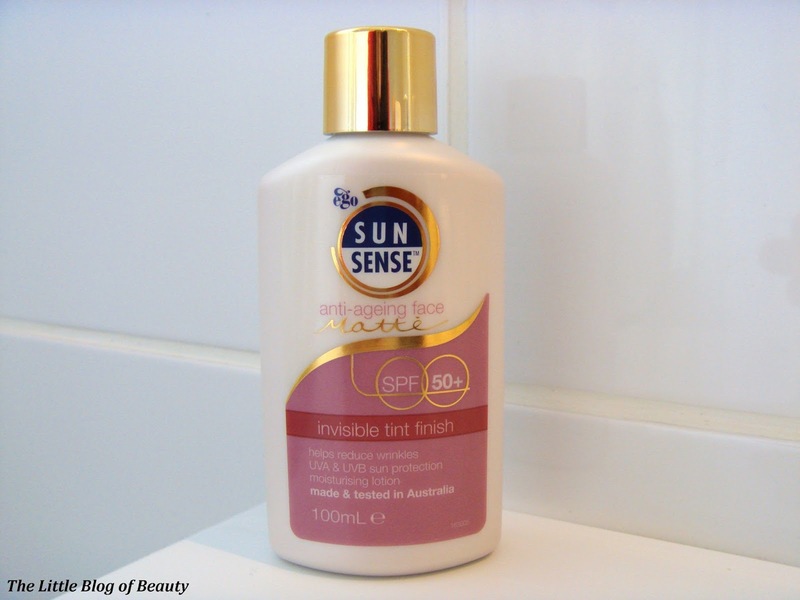 I believe it gets pretty hot in Australia and Australian sunscreen has to meet tight government regulations which forbid misleading claims regarding water resistance and the level of protection required. I was sent four products to try out. Even when I do apply sunscreen on my face when I'm on holiday or just soaking up a bit of sun in the garden I have to admit that it doesn't really cross my mind to apply anything directly to my lips. I might apply a lip balm, as if I'm not wearing some kind of lipstick I'll usually be using a lip balm regularly, but it's likely that whatever balm I apply contains little to no SPF at all. I don't think my lips have ever actually got burnt, but I do have some freckles on my lips and all my other freckles are up over the tops of my cheeks, so I'm aware that this may possibly be a sign of sun damage. 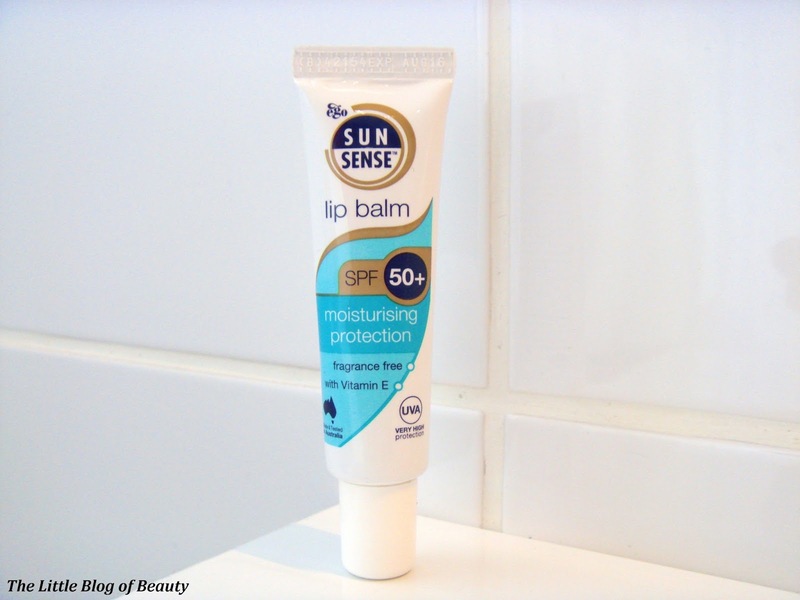 The SunSense lip balm contains SPF 50+ with UVA and UVB broad spectrum, is fragrance free and contains Vitamin E. This is very similar to Blistex Intensive Moisturiser in terms of the packaging (a flat slanted applicator you use to apply the balm to the lips) and the consistency and appearance of the actual balm. I find this soothing and moisturising and not sticky in anyway and I'd be happy to wear this under another lip product such as lipstick. Being a lip balm the product is obviously compact and is very easy to apply so you can drop this in your bag to carry around with you to apply as often as you wish. 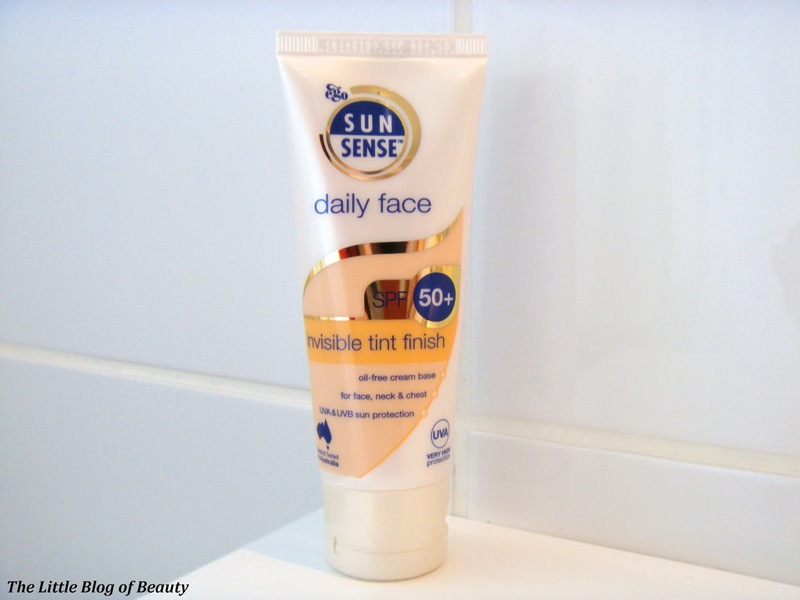 The newly formulated Daily face invisible tint finish contains SPF 50+ with UVA and UVB broad spectrum as well as Vitamin E and 3% niacinamide to help improve the appearance of skin tone and texture. This has an oil-free base, so would be idea for combination and oily skin types. This is tinted, but as the name suggests, once applied to your skin this is invisible but yet it does manage to balance out your complexion slightly. I would say it's about on the same level as a BB cream, although I'm not personally keen on BB creams myself as I usually need a higher level of coverage. Although saying that, for use on the beech, when I obviously wouldn't usually be wearing any makeup at all, this would be ideal to balance things out slightly and provide a high level of sun protection at the same time. In terms of wearing this under makeup, I found that this particular one didn't feel like it absorbed completely and did leave my face a little sticky/tacky, so I wouldn't personally wear this one under makeup. This one contains the same as the Daily face invisible tint finish but also contains Lactic acid for its anti-aging benefits and provides a matte finish. I found that this one didn't leave my face feeling sticky, so I would be happy to use this under makeup. Athough it didn't leave a sticky feeling on my skin it did take around 15 minutes to be fully absorbed and so this isn't one for if you're in a hurry in the morning, you would need to be able to leave enough time before applying makeup over the top. Like the Daily face this one is also tinted but again the tint isn't visible once applied to the face but does manage to balance things out slightly. So this one might be good as a bit of a helping hand underneath a light foundation or even a BB cream. This one is the same as the Anti-aging face matte but doesn't have the same matte finish. I find this closer to the Daily face one, although this didn't leave my face feeling quite as sticky as the Daily face did, but again I don't think I would wear makeup over this one. This one also doesn't have a tint finish to it so is closer to a traditional sunscreen. Although I don't think I've found the perfect product for wearing daily under my makeup I would use the Anti-aging face matte on days where I wasn't particularly in a hurry to get ready in the morning so I could give it the time it needs sink in. Don't forget though that with any sun protection product you are supposed to apply this 15 to 30 minutes before you go out into the sun. With regard to the other face products, although I wouldn't wear these under makeup I would definitely use them if I wasn't planning to wear makeup anyway, if I was going to the beach or catching some sun in the garden. The lip balm will also be going in my bag to help protect my lips when if the British sun ever decides to come out. You can find SunSense products over on the SunSense website and these are also available through John Lewis and Waitrose. Just before I finish on the subject of sun protection I want to touch on how much sunscreen you should actually be using. If you're spending the day on the beach you should be using about a shot glass full of sunscreen and should reapply the same amount every two hours to keep up the level of protection. It should also be reapplied after going in water, whether you're drying naturally or using a towel. So after a day on the beach one person should have used around a quarter to a half of a standard sized bottle of sun cream. Just like not wearing any sun protection on my face I know I'm also guilty of not wearing enough sun protection on my body. Do you wear the correct level of sun protection?